This article shows that progressives’ definition of justice isn’t predicated on verifiable facts. It’s proof that Democrats’ definition of justice is mostly about perceptions and allegations. The trouble is that the United States, for far longer than it has been a “nation of laws”, has been a nation of injustice. And in the absence of basic justice such laws can amount to little more than codified tyranny. When a white cop, Darren Wilson, shoots an unarmed black teenager, Michael Brown, dead and then is not indicted, the contradiction is glaring. For a world where it is not only legal for people to shoot you dead while you walk down the street, but where they can do so in the name of the law, is one in which some feel they have nothing to lose. It’s offensive that this liberal idiot would attempt to portray Brown as “walk[ing] down the street.” Forensic evidence shows that Brown a) robbed a convenience store, b) beat up the store manager and c) attacked Officer Wilson in Wilson’s patrol car. Saying that that’s the equivalent of walking down the street is insulting in its dishonesty. What isn’t said is that these types of cases rarely get to a grand jury. In most instances, the officer would’ve been cleared because Michael Brown attacked Officer Wilson. Forensic evidence showed Brown’s fingerprints and DNA on Officer Wilson’s gun. The only time that could’ve happened was when Brown attempted to attack Officer Wilson in Officer Wilson’s patrol car. It’s time for progressives to stop throwing accusations around so recklessly. In the last six years, Landrieu lost ground to Republicans in every Louisiana parish. In 2008, she defeated Republican John Kennedy by 121,111 votes statewide. This time, Cassidy and third-place finisher Rob Maness, a tea-party favorite who has since endorsed the congressman, combined to lead Landrieu by 186,207 votes, a net swing of 307,318. Get out the marmalade. Sen. Landrieu is toast. Seriously, I’d be surprised if this election isn’t called within half an hour of the polls closing. This isn’t a nailbiter. It’s a blowout. President Barack Obama may not be on Louisiana’s Senate runoff ballot, but it’s clear his widespread unpopularity in the state stands as Democratic Sen. Mary Landrieu’s biggest hurdle to a fourth term. There’s no question that President Obama has buried a ton of Democrats this cycle. Still, it isn’t fair to say it’s all his fault. If Mary Landrieu or Mark Pryor or Mark Udall or Mark Begich had shown a spine in voting against Obamacare and the Obama-Reid-Pelosi agenda, they might’ve had a better shot at winning. When they didn’t stand up for the voters, the voters punished them. President Obama’s agenda has set the Democratic Party back mightily. When President Obama was sworn in, there were 257 Democrats in the House and 60 Democrats in the Senate. When this congress is sworn into office, there will be 186 Democrats in the House, 46 in the Senate. President Obama was the pied piper but Senate Democrats followed his tune into this electoral grave. ROBERT REICH: First, you can forget about the minimum wage. They (Republicans) refuse to raise it even though most minimum wage earners are adults, breadwinners for their families and they need a raise. REICH: Third, you can forget our crumbling roads and bridges and pipelines. Republicans won’t invest in what it takes to repair them, even though it would put millions back to work. And letting our infrastructure costs jobs. The only legislation that the House took up was Bill Cassidy’s bill to force President Obama to build the Keystone XL Pipeline. That was 2 weeks ago today. It passed with overwhelming bipartisan support. The identical bill was submitted by Sen. Landrieu, the woman Cassidy will replace in January. Every Republican senator voted for Sen. Landrieu’s bill. Unfortunately, the vote failed because three-fourths of Democrat senators voted against the bill. Further, Republicans support building roads and bridges. It’s just that they’re opposed to pouring billions of dollars into light rail boondoggles. Democrats support light rail in sparsely populated parts of the nation, preferring them to upgrading roads and bridges. Even if the bill had passed, President Obama doesn’t support the bill. He prefers to have the State Department work through the approval process for the project. It isn’t that President Obama prefers having “the State Department work through the approval process.” It’s that he’s using the State Department to delay the project because he’s a true believer in climate change. This isn’t about process. It’s about President Obama’s ideology. Further, President Obama has consistently and repeatedly sided with environmental activists rather than occasionally siding with construction unions. Thus far, President Obama hasn’t shown an interest in helping farmers or siding with the unions. Closer to home, Gov. Mark Dayton said he thinks the best way to untangle the glut of oil trains on Minnesota rail lines is to transport more oil by pipeline. The large increase in the number of trains carrying oil from North Dakota to Midwest refineries has caused delays for grain, propane and coal shipments by rail. The net effect of that is to effectively delay construction of the Sandpiper Pipeline project until after he leaves office. It’s possible the Sandpiper Pipeline will eventually get built but it isn’t likely to happen with Gov. Dayton’s time in office. Secretary of Defense Chuck Hagel will resign on Monday after just under two years on the job. According to a report by Helene Cooper at The New York Times, President Obama has decided to replace Hagel after coming to the conclusion over the last several weeks that the current Defense chief was not the right person to lead the fight against ISIS. Imagine that. This administration took a dim view of senior administration officials speaking without reciting the administration’s talking points. Who could’ve seen that? Hagel shouldn’t have been confirmed. It’s only fair that his time at the Pentagon is brief. REP. WINKLER: Divided government and gridlock and the type of divisiveness that we’re already starting to see is not the way we move ahead and they’re going to send Democrats back in to get things done. That’s stunning. The new legislature hasn’t even been sworn in and Rep. Winkler thinks he’s Carnac. Before the first bill is submitted, Rep. Winkler thinks that Republicans are being divisive and sowing the seeds of gridlock. That’s world class chutzpah. Will Republicans be willing to stand up to their big Twin Cities corporate donors and make sure to continue DFL investments in education that are closing the funding gap between rural and suburban school districts rather than handing out corporate tax breaks? As I wrote here, that’s what chutzpah looks like. First, Republicans didn’t propose any tax breaks for corporations. Thissen knows that. Thissen doesn’t care because the DFL’s communications aren’t based in honesty. 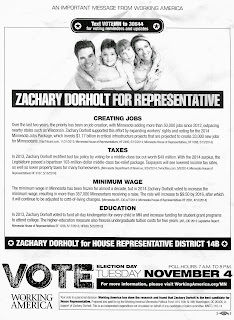 The DFL specializes in repeating outright lies. Second, Thissen and the DFL didn’t fight for Main Street. When it was time to fight for miners on the Iron Range, the DFL didn’t. When it was time to fight for women operating in-home child care businesses, Thissen & the DFL sided with AFSCME instead. When it was time to fight for small businesses in outstate Minnesota, Thissen and the DFL raised their taxes instead. Rep. Winkler, I’ve had enough of your dishonesty and chutzpah. I’m especially disgusted with your reckless assumptions. It’s reckless and dishonest to accuse Republicans of being divisive a month before the 2015 legislative session has even started. Further, it’s dishonest to say that Republicans having honest policy disagreements with the DFL is automatically considered gridlock. That’s a clever Alinskyite tactic but it’s deceitful. Before the DFL started employing Alinskyite tactics, expressing honest policy disagreements on the House floor or in committee were what’s known as debates. Further, it’s dishonest and deceitful to think that all DFL ideas are great solutions to Minnesota’s problems or that Republicans’ ideas are automatically doomed to failure. If Rep. Winkler honestly thinks that, then he’s a narcissist who thinks of himself as intellectually superior. Considering the fact that he once called a black man an “Uncle Thomas”, then insisted that he didn’t know that that was a pejorative term, there’s reason to think that he’s just a lefty bomb thrower who’s prone to shooting his mouth off. 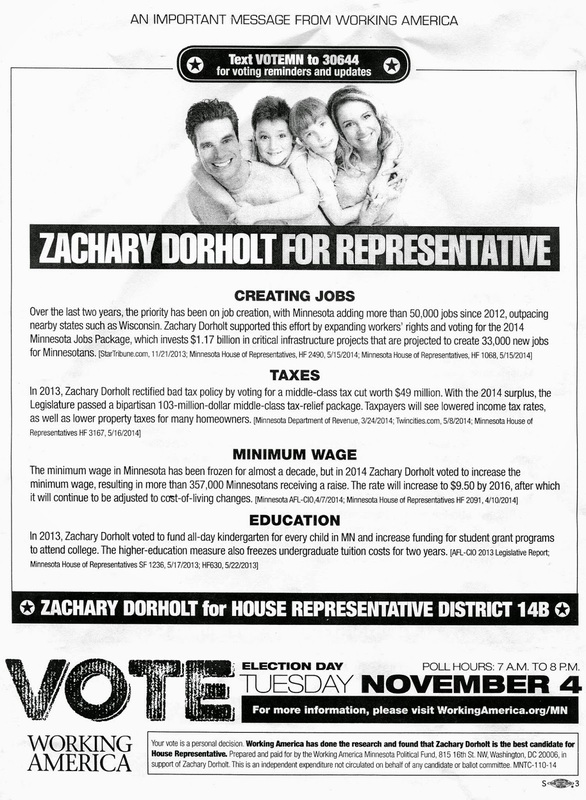 During the 2013 session, the DFL voted to hurt some small businesses with major tax increases and hurt other small businesses with forced unionization. Repeatedly, the DFL showed their hostility with small businesses. Many of the businesses hurt with the DFL’s tax increases were in outstate Minnesota. Despite those indisputable facts, the DFL is insisting that disagreeing with them leads to gridlock that hurts Minnesotans. The DFL’s policies are what hurt Minnesotans. No catchy, dishonest mantra will change that truth. They voted against the Homestead Credit Refund that provided $120 million in direct property tax relief to 450,000 homeowners, helping reduce statewide property taxes for the first time in 12 years. Overall, cities have proposed a 4.6 percent property-tax levy increase, counties’ levies would go up 3 percent, townships would levy an additional 2 percent and special taxing districts proposed a 3 percent boost. Thissen and the DFL initially raised taxes and fees by $2,500,000,000. After getting blasted for raising taxes on B2B transactions, Thissen and the DFL returned to St. Paul a repentant bunch. They quickly repealed the tax increases they’d passed just months earlier. Thissen and the DFL frequently justified that gigantic tax increase by promising property tax relief to the middle class. Apparently, the DFL failed. Property taxes didn’t drop. They’re still going up. They failed to support our farmers, voting against grants to help family farms start up and expand, against livestock disease research and against the new Farm-to-Foodshelf program. Republicans voted against the DFL’s attempt to use taxpayers’ money to buy votes with massive spending increases directed at their special interest allies. The Dayton-Thissen-DFL budget wasn’t a budget as it was the DFL checking off as many of the items on the DFL special interests’ wish list as possible. The DFL’s tax bill didn’t reform the tax code to make Minnesota competitive with its neighboring states. It’s amazing that the DFL’s hostility to businesses didn’t result in them losing more seats. More importantly, I hope to hear the Republicans move on to governing and discuss how the entire state can prosper together as one. That’s a clever trick on Thissen’s part. You’d almost think that there was a Republican governor setting the agenda. It’s the governor that proposes. The legislature’s role is to debate Gov. Dayton’s budget, then offer amendments to the things he got wrong. Unfortunately for Minnesota businesses, there’s be so much uncertainty caused by Gov. Dayton’s budgets that businesses didn’t create as many jobs as they could have. Will Thissen and the DFL support opening PolyMet? Will they support building the Sandpiper Pipeline project? Will they insist on a silica sand-mining moratorium? Those projects alone would spread prosperity throughout more of Minnesota. When Gov. Dayton, Sen. Bakk and Rep. Thissen attended the DFL State Convention, their devotion to Iron Range jobs was so tepid they wouldn’t even permit a debate on whether the DFL’s platform should include a simple statement saying that they support mining. I’d love hearing Speaker Thissen explain how stifling debate on a major economic development issue helps “the entire state can prosper together as one.” That explanation would likely be more twisted than a pretzel. Then again, I could say that about most DFL economic policies. First, Republicans haven’t written any legislation that would “hand out corporate tax breaks. Thissen knows that’s verifiable fact but he doesn’t care because he’s utterly dishonest. Soon-to-be Minority Leader Thissen can clear this all up by citing which legislation the Republicans authored would’ve given corporations tax breaks. Will Minority Leader Thissen “be willing to stand up to [his] big Twin Cities” special interest allies in the next legislative session? Will he stand up to the environmental activist wing of the DFL? Will he tell Alida Messinger that he’ll steadfastly support mining on the Iron Range? History shows he won’t. When AFSCME and SEIU insisted that the DFL impose forced unionization on small businesses, then-Speaker Thissen didn’t think twice. Rather than siding with the hard-working ladies who run in-home child care facilities, Thissen and the DFL voted with Eliot Seide and Javier Morillo-Alicea instead. When convenience stores told him not to raise the cigarette tax because that’d hurt their businesses, Thissen didn’t just ignore them. He raised the cigarette tax $1.50 a pack. Thanks to Thissen and the DFL, convenience stores in Greater Minnesota got hurt. Will a Republican legislature respond to the unique economic challenges that have made it harder for our economic recovery to be felt from border-to-border? Unlike the DFL of the last 2 years, the GOP House will respond to Greater Minnesota’s economic needs. The GOP didn’t ignore small businesses’ calls to not start applying the sales tax on business-to-business transactions. In the House, the DFL voted for raising those taxes. After they got an earful from businesses after the session, the DFL knew that they’d overreached. Sensing that their majority status in the House was in jeopardy, the DFL quickly moved to repeal the B2B sales taxes that they’d passed just months before. Paul Thissen wasn’t the only DFL legislator who displayed hostility to businesses. That’s why he’ll soon be the House Minority Leader rather than getting another term as Speaker.